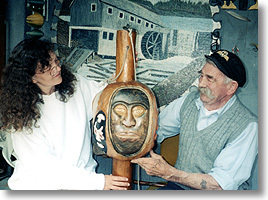 A highly regarded carver of canes, Ray used only natural branch or root formations for his work. In 1941 Ray was serving on the Imperial tanker Canadolite when it was captured by a German warship off the coast of West Africa. He and 40 of his shipmates were held as prisoners of war until 1945. As a POW, he was issued a metal identification tag containing his POW number: 93610. Towards the end of his incarceration, Ray found an old bread knife which he sharpened on a stone. Using this knife, and a piece of wood he found, he carved a cane with a snake twisting up the shaft. After returning home to Canada, Ray worked as a carpenter and an aircraft mechanic. Following his retirement, he started carving canes again. On each cane he carved, he placed his trademark - the letters POW and his prisoner of war ID number. Ray displayed his carved canes in numerous exhibitions during the 1980s and '90s, but only sold a few, and then only to the most persistent suitors. In 2000, the Art Gallery of Nova Scotia acquired a number of Ray's canes for its permanent collection. It is estimated that Ray carved fewer than 100 canes during his many years of carving. In his later years, Ray also carved four "burls" such as the one shown above. Ray passed away in 2003.